ETDA is launching the ‘Young Talent Platform’ during Thailand’s e-Commerce Week 2019 (31 January – 2 February 2019) to bring together young Thai people with the aim of helping them be digitally ready for working in the e-Commerce era. The Electronic Transactions Development Agency (ETDA) announced that they aim to attract 1 million teenagers to join the e-commerce workforce and 200,000 micro-SMEs to go online this year to boost the online economy. In order to meet this goal of a skilled digital workforce, the ETDA are setting up an E-commerce park. The e-Commerce Park concept comes from China, where 2,000 e-Commerce Park locations are located around the country. The ETDA has signed a MOU with Dong Guan Province, China’s no.1 e-Commerce district for exchanging ideas and experiences. The establishment of e-Commerce Park comes from the collaboration between ETDA and Srinakharinwirot University through Memorandum of Understanding (MOU) to promote electronic transactions and e-Commerce. During the e-Commerce week, there will more collaboration with other educational institutes to help increase the numbers entering Thai e-Commerce market. Srinakharinwirot University is going to be the first prototype location for the e-Commerce Park. The e-Commerce Park at Srinakharinwirot University, not only aims to be the center of education and training but will also work with agencies overseas to create more channels for Thai businesses to export their products to global markets. The Park is going to be an e-Commerce hub which supports the Thai e-Commerce industry from SMEs, product manufacturers to service providers, both domestic and international. It will be a knowledge centre and business network centre to help give businesses a competitive advantage and to ensure they meet international standards. “Young Talent Platform” will be launched at the upcoming e-Commerce week at the end of the month to support the workforce by gathering Start ups and experts to create the first centre of e-Commerce in Thailand to develop it’s e-Commerce ecosystem. The services on offer will range from e-Commerce business consulting, searching for jobs, searching for funds, business matching, e-learning and online media connected to the e-marketplace and it will also include services for business registration. The platform will help building an entire community of young talent ready to exchange knowledge and to assist with using e-Commerce tools such as e-Payment systems and Online Marketing platforms. 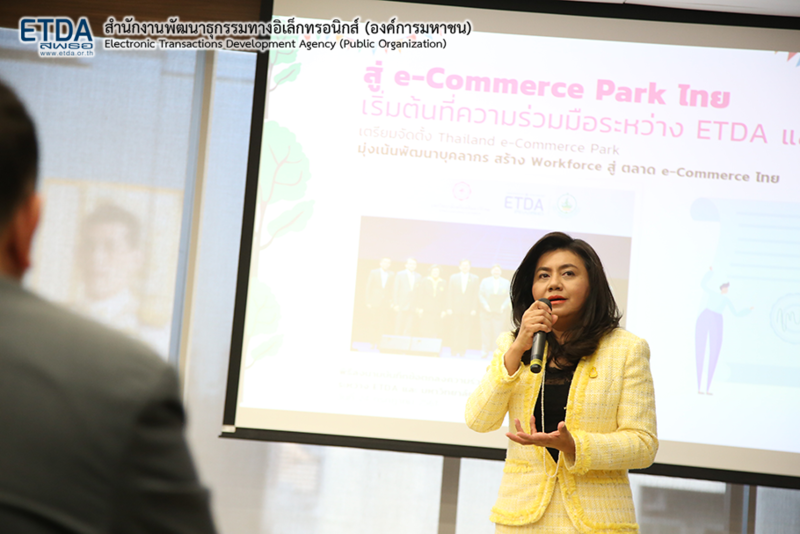 ETDA also set priority for developing and supporting manpower by cooperating with leading educational institutes to support the newly graduates or students who seeks to earn money by joining e-Commerce Park where the young generation are able to develop their potential and assist SMEs to use e-Commerce tools securely and correctly,” Mrs. Surangkhana stated.